Russia's bullying of its neighbours illustrates why the UK must keep its nuclear deterrent, according to a Midland MP. Russia’s bullying of its neighbours illustrates why the UK must keep its nuclear deterrent, according to a Midland MP. Shadow Foreign Minister John Spellar (Lab Warley) said Russia wasn’t just threatening the Ukraine but also Baltic states. But in a sign that historic rows over nuclear weapons haven’t been entirely banished from the Labour Party, he clashed with one left-wing backbencher who called on Britain to scrap its nuclear weapons . 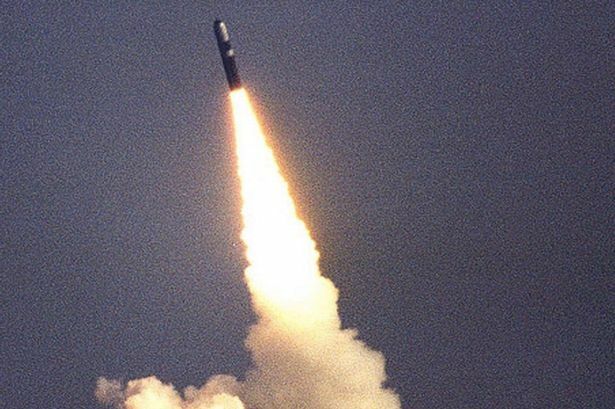 Paul Flynn, who represents Newport West in Wales, pointed out that the general election on May 7 could result in a hung Parliament in which Labour depended on the support of SNP MPs – who oppose renewing the Trident nuclear weapon system – to form a government. Regardless of who is in power, the Government will have to decide next year whether to go ahead with building new submarines to deliver nuclear warheads, at an estimated cost of £25 billion. A new warhead, costing an estimated £6 billion, will also be needed. But Mr Spellar replied: “My honourable friend the Member for Newport West repeated what has been said in other debates that have been based on the proposition that nuclear weapons are an inappropriate response to many of the very real contemporary threats that we face, such as terrorism, insurgencies, cyber-attacks and climate change. “Of course, they were never designed for that purpose. That is not their role. They are focused on state-on-state conflicts. He added: “It is not only the actions in Ukraine that are causing concern; they are merely the most extreme symptom of a number of problems that have been manifesting themselves. Russia had tested the military capabilities of the UK and other European countries by sending planes close to UK airspace, he said. Mr Spellar said it was “important for Britain to play a constructive role in working for a nuclear-free world by not removing itself from the equation through nuclear disarmament”. Mr Flynn said Labour should be ready to do a deal with the SNP – and warned that Labour MPs would not agree to a “grand coalition” with the Conservatives, an idea suggested as one potential option by Birmingham Edgbaston MP Gisela Stuart. He said: “Although I hope and will do all I can to make sure that colleagues in my party in Scotland are re-elected , the message I see day after day is that we are likely to have a group of people here who have put the ending of Trident at the top of their agenda.